So today I’ll get them finished, without a doubt. 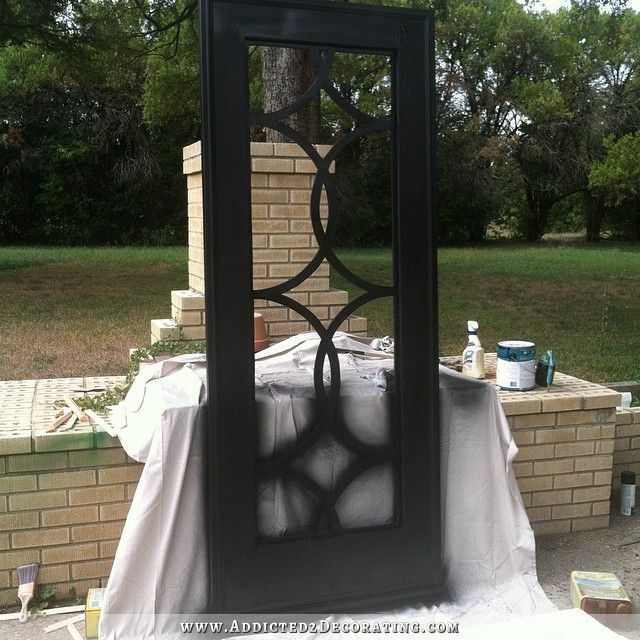 I did share a sneak peek of one of the doors painted black on my Facebook page yesterday. Here’s that picture in case you missed it. This is the back side of the door. Her advice? Keep them simple. No upholstering, no nailhead trim, no gold leafing. Just do black doors in a simple design — either standard six panel doors, or a design to match the French doors, or another simple design. Except instead of the design being repeated on the door, I only want one large design on each door. 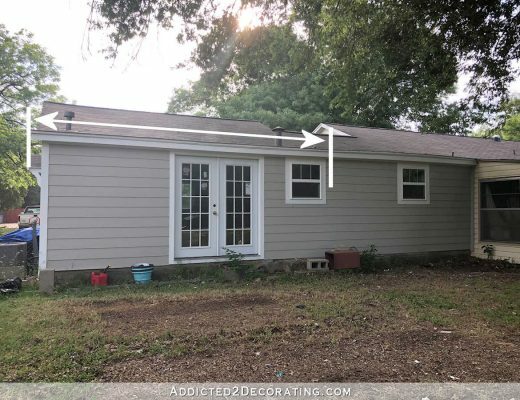 And instead of it being painted in a contrasting color, I want the design to be done in a very simple trim and I want the whole door (trim and all) painted black. It’ll be just enough to make the doors interesting and unique, unlike anything you can just pick up off the shelf at Home Depot. But it won’t be so much that the doors become a major focal point that competes for attention. My main problem (temptation) with this house is that there are sooooo many things I want to try. I’ve been saving photos for years (long before Pinterest) of projects I wanted to try out when I had a house again. That file on my computer is huge, and packed full of probably two thousand pictures of ideas that I want to incorporate into my house. The problem, of course, is that my house is only so big, with only so many rooms. It can’t hold a thousand awesome decorating ideas. I’d need at least twenty houses to hold all of the decorating ideas I want to try out. So seeing that this is (hopefully) our final house, I have to try to rein myself in and only select the absolute best projects that will work in my house, rather than trying to do ALL OF THE THINGS that I’ve been collecting for the last eight years. That has proven to be very challenging for me. Another problem I have is that there are certain things I seem to be drawn to over and over and over again — things like nailhead trim, gold leafing, and herringbone. If I didn’t exert some self-control, I’d have a house filled with those things on every imaginable surface. So I really have to be choosy about how I incorporate those things so that I don’t go overboard with them, and so that the things that actually do have nailhead trim or gold leaf look special and don’t get lost in a sea of other mediocre items with gold leaf and nail head trim. Do you find yourself having this problem also? I actually think that Pinterest has made this problem even worse for many of us. It has made it even easier for us to collect thousands and thousands of decorating ideas. And once you have that collection of thousands and thousands of ideas, how in the heck do you go about whittling those down to the ten or so awesome ideas you’d actually like to incorporate into your house? It almost seems like an impossible choice. So how do you do it? And are you like me in that you find yourself drawn to certain things over and over again? If so, what things are you drawn to that you have to really make a conscious effort to not go overboard with? I agree. I see so many beautiful ideas out there that I want to put them all in — my next house! I am in a townhouse now and because I know it’s not my forever home I have no desire to spend the time and money to make it what I want it to be. But! I want to live in my preferred aesthetic now – oh dilemmas!!! I think you are balancing your wants/desires beautifully! Keep it up, you are a huge inspiration! I agree, hard choices and so many great ideas. Here is the outline of how I do it using pinterest. Then I go thru those pics and narrow it down into another folder I lable Master Bedroom Selections. Then I modify my final choices based on what I find because naturally sometimes I find something I like better when I’m on the hunt. I do modify as I go along as each new thing is added to the room but find I do stick with the basic ideas I selected from the many choices out there. It is a dillema that is for sure. Years ago ( prior pinterest) when we were planning the build for our home, I started ripping pages from every concievable magazine of what I liked from wall color to table lamps. I saved these in an old boot box (actually ended up with 3 boxes crammed full) from where my hubs bought work boots. Anyway every three to four months I went through those torn and tattered pages and selected those that spoke loudest to me placing them in a new box by the time we finished the build I knew exactly what I wanted and within six months had the home decorated frome floors, drapes, furniture etc. Should be easier with your talented discerning eye, just go with your heart and your home will be as lovely as you are. Oh I am so glad you have to make these decisions! My hubby would have taken my phone, taken the computer AND shut off the Internet so I could no longer look at any options I might want instead. And lastly, everything you do is stunning! You can use my house too! I just love what you are doing! I do this. Too many ideas. I try to focus on the room and then back my lens up to look at the whole house. It all needs to work together. When I was younger, I tried everything. Every room was different: colors, styles, textures, etc. Nothing went together, and it was just too busy. As I’ve gotten older I find that the interiors I admire are ones with a comprehensive quality. All the rooms go together in some way. They are all speaking the same language. Right now I’m struggling with wanting to do all the stuff that you are doing because you make it look easy and beautiful! I’ve got some hallway doors crying out for help and I’m thinking I could do the inserts similar to your barn doors. But… will they pull focus from the living room? Will they overshadow the design elements in my hallway? The pattern I really want to try is probably too energetic, so I’ll need to compromise with something more subtle. At that point I have to ask if it’s worth the effort. These pieces all need to complement each other, not fight amongst themselves. I try to keep that in mind. Then the big life lesson for me is that I don’t have to have everything I want. Sometimes it’s enough that someone else has it and I can appreciate it from afar. I’m learning to let some things go. I think you do a good job of balancing. You took out your gorgeous painted kitchen floor because you recognized it didn’t work. I think that in the end, you are able to evaluate the whole and trust your instincts. Just keep doing what you’re doing. And keep sharing your struggles! It helps the rest of us know we are not alone. Shelby, excellent comment & advice. “Not having everything I want” truly hit the mark for me & my home. Exactly….so well put! The older I get the easier it is to appreciate what others have and not feel I need to have it for myself. It makes a simpler life so much more enjoyable! I’m not a decorator, but I have decided long ago that the first principle of good decoration is “Learn to say no”. Otherwise you end up with a house that looks messy instead of decorated, and has no particular character or mood. For me the answer to this problem is your second problem: What do I find myself being drawn to again and again? What is the common characteristic in all my pictures – why was I drawn to each one? Is it because the craft I see is so awesome, or is it just that the colours coordinate in a manner that appeals to me, or I love the pattern I see? If I saw the same thing in a different setting/colour would I still like it? In which case I can skip the crafts and stick to the colours or whatever it was I liked. So I’d say give priority to what you see yourself returning to again and again, and make it your starting point – then check what other ideas fit with it. Because I think you are awesome, I want to help you out. Therefore, I am offering you my house to do with as you wish. Move in here, I live at the beach, by the way, and use as many of your ideas that you can cram into your second home! Love your style, girl! Love reading your blog! I look forward to it everyday. You are an amazingly talented women. Just an idea some of the fantastic looking doors you want, try on the backsides of the doors. As an example the backside of Matts game room door can be upholstered with nailhead trim. When your in the room you can appriciate it but it won’t be overwhelming or too much for your house. Keep it up and have fun. About a year ago (little less) I painted and did a little redo on my kitchen. I painted my cabinetry what was suppose to be a soft but saturated grey but turned out a beautiful blue grey (something I never would have chosen). But I have always leaned towards white kitchens. I look through my computer pics (yes I have a collection of way too many also) and Pinterest and I am still always drawn to white kitchens with open shelving. It has taught me to go with my gut. And before doing any project now I know, to go back and find the 10 ten picks of that particular project and know what I like best. Unfortunately, a lesson learned the hard way and that means another cabinet paint redo after the holidays. While I love how they turned out, they are not my dream color and I don’t want to settle. Yuck! Wish I’d figured out the importance of my collection first. So for me, Pinterest has helped me to define my likes, even though yes, somewhat overwhelming at times. Kristie, I LOVE your black doors and agree with mom…simple is better. Can’t wait to see the finished product! I love Phoebe’s comments. I have owned about a dozen homes and I quickly found out that it was impossible to cram everything, every item or design idea that I love into one home. Also, I’m an artist and artistically speaking a room can have one focal point. One. Anymore than one, and you have destroyed the focal point and made a chaotic design for the eye, which is unsettling. And, all of elements must compliment the other elements. Which is why you would not have herringbone, polka dot (nail head), stripes, geometrics, paisley, multiple colors, textured items and etc. all in one room, without giving the eye a place to rest in between. Too many design elements combine, textures, lines, colors, and such add to the overall effect, therefore it’s important that the focus not be on each item but on the overall entirety of the room. (or painting as the case may be) Also, keep in mind the nature of your home. A 1,800 sq foot ranch, more than likely, does not accommodate French doors with balconies off each off the bedrooms and Italianate pilasters on the porch just because George Clooney’s villa has them and one loves them. Some elements combine pleasantly, others do not., and too many is never a good thing. So,being a decorator allows you to incorporate some of your wonderful ideas into others’ spaces and enjoy sharing them with them!! Win-win!! You are correct that there is too much information available these days-just an overload. Oh, when I decorate, I have a ton of extra decor and I rotate seasonally and sometimes don’t use one piece for a couple of years and then I bring it out again, sometimes with a fresh coat of paint or some antiquing or whitewash. I think simple is always better but that goes with my style and might not work for others. I also think that those of us who ‘collect’ ideas throughout the years want to try everything. I’ve got thousands of pins and am sure I’ll only ever try a fraction of them but its fun to look, collect and try what I can. Cheer up! You are young! You will be reupholstering, repainting, repairing, restyling and blogging about it for years to come. I am looking forward to following your progress. Isn’t it great how our moms get smarter the older we get? I’ve been working on my house lately and updating things. I have found I’ll find things I’m drawn to but have no idea where I could put it in my house. Running out of space. I also don’t like the idea of buying decorative shelf items that look pretty but have no real value to me. No sentiment. I feel like it’s such a waste. Picking a few favorites and using them in every room gives a house cohesion. Otherwise, every room tends to look as if it were designed by someone different. For example, I love navy blue. I finally realized this about myself. It’s in every room of my house in some way, big or small. But from there, I play. Different colors, different structural elements, etc., but that one common element gives the house flow. Cindy, I love navy as well. I live in an “energy-efficient” (this means it doesn’t have a lot of windows and is dark) 1800 sq ft home. I try to not buy things unless I love them. I have bright brass, wood stained trim and popcorn ceilings, all of which may get changed at some point. But it is on five forested acres and we love it. I am fortunate to have family that believes in my power to transform things. This is both a blessing and a curse LOL! I am drawn to both traditional and rustic design but my husband with severe back issues has found ekornes/ Danish modern chairs are the only ones he can sit in comfortably. Somehow it works in an eclectic way and we like it. That is the most important thing I think, to work toward the house / decor you want. Like you sais, one element that flows be it color, style or function can bring a pleasing cohesion. I understand this idea, but when I decorate my own home, I find that the first decision determines the direction and gets rid of many of the things I had liked. For example, if I have photos of bathrooms with all different styles I like, then as soon as I choose beadboard on the wall, I have eliminated all things that don’t go with beadboard, which might be a Moroccan light, a very modern vanity, etc. When I make the second decision, it sets the tone even more. I have also found, as others mentioned, that I do not need to own everything I like. I’m perfectly happy for someone else to own it, and I can admire it. I gasped out loud when I saw your black door – STUNNING! I so want to make one too. Black is going to look great and, boy the design sure pops in such a good way! I understand your train of thought about collections of ideas and things in general. Setting a number limit of how many items I want in a collection helps me cut off the desire to keep adding. I decided I wanted a collection of Snowbabies and three was my pre-decided number and that collection is now complete. Now my family and myself are not prone to pick up a Snowbabies for me for every vacation, birthday or celebration. Same with a favorite piece of clothing. Even though that favorite sweater is well made and is truly a great price, why do I need every color no matter how good the price? One can only wear so many sweaters. So I go into the sale reminding myself I have a sweater and remember I can buy one because I have predetermined that two in my closet is my limit. Hope you door day was productive. Looking forward to the big reveal! They never disappoint. I’ve learned to stick with my true loves. I’m a simple girl and I like simple things. Sure, I may adore a pattern or design but if I take it home, it would drive me crazy lookin at it every day. I love browns and whites and light and an open, airy look. While I may think someone else has a beautiful house, it wouldn’t work for me on an everyday basis. So I can narrow things down pretty easily by asking myself if I’ll still love something in 6 months…if the answer is no, then scratch it. Is your taste the same as when you were a teen? 20- something? 3 yrs ago? Mine wasn’t. When I bought my cape cod in 1991, I wanted an Italian Countryside look. Now, I envision a more traditional but relaxed cottage look. When we retire to Florida, well, that’s another whole thing to deal with. I think I have the solution to your “too many ideas” problem. Once you’ve finished your house, you can come on over to mine and use the “next best ideas” here. Then I think we could both be happy. LOL! Thanks for your blog Kristi, I love it! Good for you to be so intuitive about yourself! Your post reminds me of the saying, “whenever everything is special, nothing is special.” Just like a movie needs movie stars to make it a hit, it also needs quality supporting players. I admire people who have decorating skills. I have the knowledge to DOING the project but absolutely NO EYE for decorating. I can build furniture, reupholster, do wiring, do masonry, sewing, etc but have no vision in coordinating colors and styles. I use my skills mostly in doing repairs or doing small crafts to make my home functional. I love that you do all your work yourself. I wish I lived near you so I could help and absorb some of your decorating skills. Thank goodness for the blessing of a budget! That’s one of the best ways to whittle down the options.And I don’t just mean monetary, but also time, energy and the willingness to endure mess and upheaval. (Though it does seem you have an unlimited capacity for those!) I was pretty iffy on cutting out those doors but they turned out spectacular. I should have known — you made green cabinets look marvellous! Beautiful work! I find that I’m always drawn to dark wood or painted finishes on furniture. But I also love dark wood floors. Granted there are rugs that can separate some of those pieces from the floors, I’m always trying to balance the dark and light in my rooms. I love Pinterest and have a million things pinned that I want to try. Luckily we are a military family and move around a lot and I always have an opportunity to try out new things and styles with each house. The downside to this is I either don’t get a chance to finish the house the way I can see it in my head or I have to leave a house without enjoying all the handwork I put into it. I love hearing about all your projects and ideas. Thank you for all the inspiration you bring us.